iPhone Savior: Is iPhone Red On Apple's Holiday Gift List? Is iPhone Red On Apple's Holiday Gift List? The cry of the masses for a return of ol' Whitey brought us the White iPhone 3G in tandem with it's evil twin cloaked in jet Black goodness. Rumors and speculation of a 3G salt and pepper iPhone team were true. 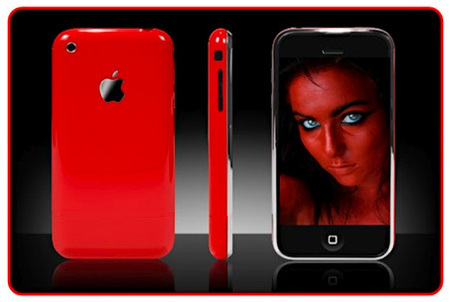 Now it's time to look forward to the emergence of iPhone Red, Apple's holiday release to boost iPhone sales. Rumors have begun to bubble under that Apple is quietly planning to go red. With the iPhone's transition to plastic casing, it's fairly simple for Apple to add color at will while keeping true to form with a Product (RED) offering. Every Firefighter and his drooling brother will want to wrap his hairy man hands around this Little Red Devil. Add an exclusive pair of red Apple All Stars to your ensemble and you'll be dangerously Mactastic. Are you seeing Red for the holidays? I am. Wow! iPhone specially in red colour, I like so much. Thanks for share good information. Red isn't always the leader, in Voltron the leaders colour was black, Thundercats the leader wore blue etc... Power Rangers are a bunch of fruits in tights anyway. But I do agree with you, a red phone would be nice. RED, WHITE, BLACK...WHATEVER! BRING OUT THE 32GB ASAP!!! Apple iPhone in red color, is really HOT. I actually work with AT&T Wireless and we are expected to begin selling them the day after Thanksgiving, which will be perfect for the Holidays, and it will be a product(RED) iphone 3G, and it will only be offered in the 16GB version. Many stores in America are on back order for the new iphone, so Apple has decided to hold off on the release of the product(RED) iphone for the last quarter of the year, to boost sales and revenue for the company. The company is making sure they have enough stock, by X-mas so everyone can enjoy the revolution of the new IPHONE 3G PRODUCT(RED) 16GB ONLY!! iPhone 3G as a modem? Think they'll put a floppy drive in it too? Yeah there is something, but you need to jailbreak it... for the question about the 3G as a modem. You end up running off its Wifi as a proxy. Hi...somebody have some news about the possibility to use the iphone 3g as modem for your pc or mac? With all the improves they COULD be adding... they are only worried about "pretty colors" instead???? I'm a firefighter and I can say that I have no want for a red iPhone. I just got my black 16GB iPhone 3G and I'm happy. Red is more of a chick color anyways. The iPhone3G logo is silver leaf. Not black. Red does look nice. Can't confirm or deny if it'll happen. if the iphone is red, the compliment would most likely be a white apple logo... not a black one as in th pic.